The shapers we are using are custom made according to our own measurements. We offer shaper B; C and D Original (shaped as dry) and shaper B; C and D Narrow (shaped as been soaked in water) eight different types of shaped cane for you to choose from. B Original and B Narrow shaper are for players prefer normal size neck staples and plays with Howarth, Rigoutat and Loree etc. instruments. Our European oboe reeds are made from type “B” and “D” shaper: “Original”: shaped as dry, “Narrow”: shaped as been soaked in water. “B” shaper plays better intonation with large bore Oboe like Loree, Howarth, Rigoutat act. “D” shaper plays better intonation with smaller bore oboe like Marigaux; Josef; Ludwig Frank; K.GE act. 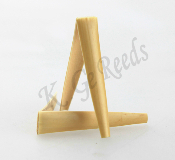 Our American oboe reeds are made from shaper C(Original) and C (Narrow). The tension of gouged oboe cane we measure with a machine designed by us here at K.GE REEDS, which is unlike other cane retailers, who measure cane by its density. We discard any cane that gives us a reading of less than “50g” on that machine as we regard it as being too “soft” to make a good reed. At the other end of the spectrum our machine has a maximum reading of “100g”. 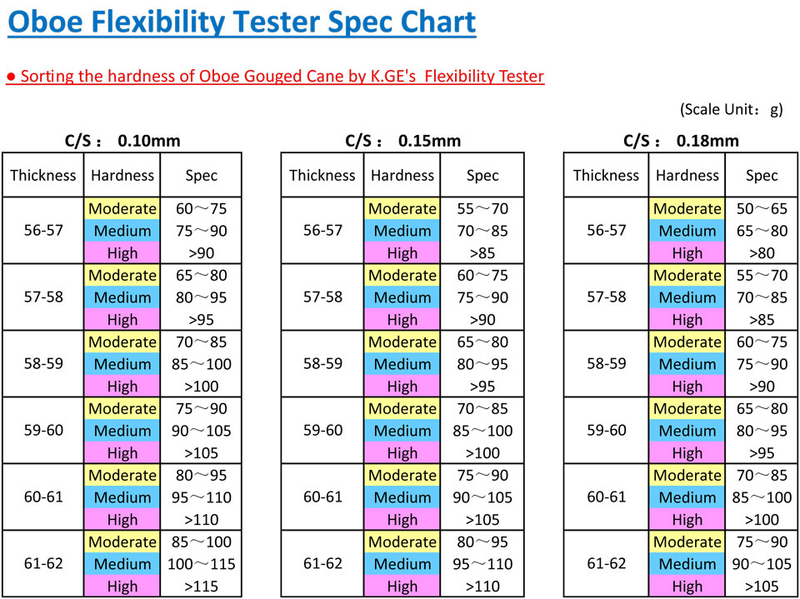 Thus, we are now able to rate all our cane as having either a “moderate tension”, “medium tension” and “high tension”, giving our customers more consistency in the inherent qualities of any given batch of cane which is purchased through K.GE REEDS. This new way of measuring the “strength” of cane is well tested in our reed making workshop, enabling us to know better which reeds are more likely to be suitable for a professional standard oboist and those which are more likely to be good for a student or amateur oboist. We have found that there is much less cane that measures in the “high tension” spectrum, and therefore it is priced higher according to its more limited availability and it is similarly the situation with the “medium tension” cane. Centre to side ratio is the difference in thickness between the centre and the side. For example, if the centre measurement is .60mm and the C/S ratio is .18, this means that the side measurement is .42 on that gouge. 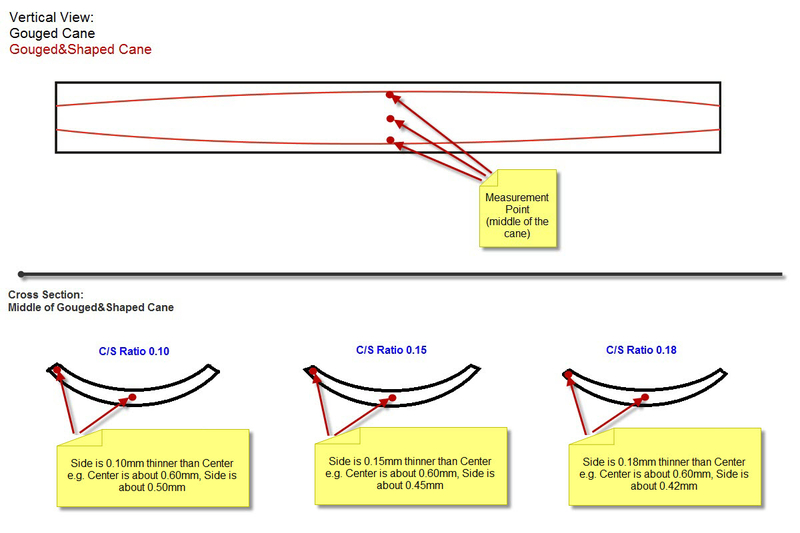 The C/s ratio is a measurement of the gouge. A C/S ratio of .15 is a reed likely to have a more robust opening than .18. If you like to scrape or adjust by taking a little cane from the sides, .15 is the better choice.